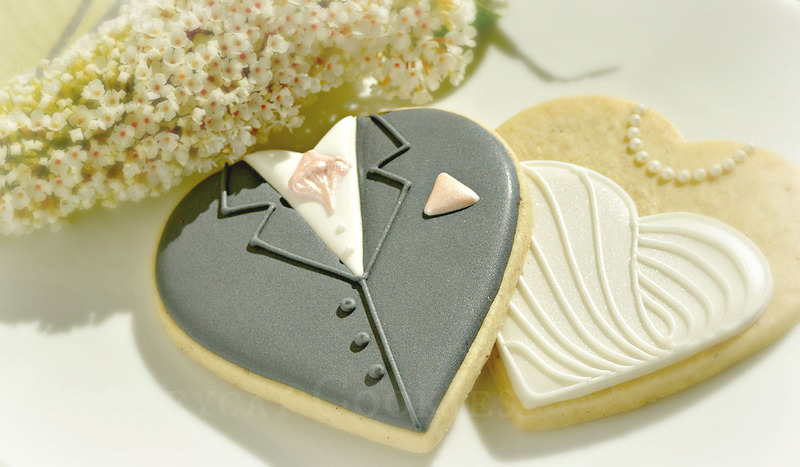 This is a classic design for brides and grooms using heart shaped cookies for wedding favours. It's not original, it's not complicated, it's perfect for the occasion, and it's easy enough to make in large numbers. This is why I've always thought it's one of the cleverest ideas around. Does anyone know where it orginated? Would it even be possible to find out now? 1. I piped the first few white shirt triangles by eye. I have a good eye. I'm fairly accurate. Except after I'd done a few I decided, just for the fun of it, to check with a ruler. Every single one pointed off to the right, enough that once the grey details were piped on it was going to look really wonky. Clearly I have a very good right eye, but the left one not so much. Or the other way around. Anyway, once I'd scraped them all off I marked the three points using the ruler. I actually marked the points using my scribe tool, so as not to get bleeding into the white, but I've shown the three points in red here. 2. Using the flood consistency white, outline the triangle and immediately fill in. Let it crust over. 3. 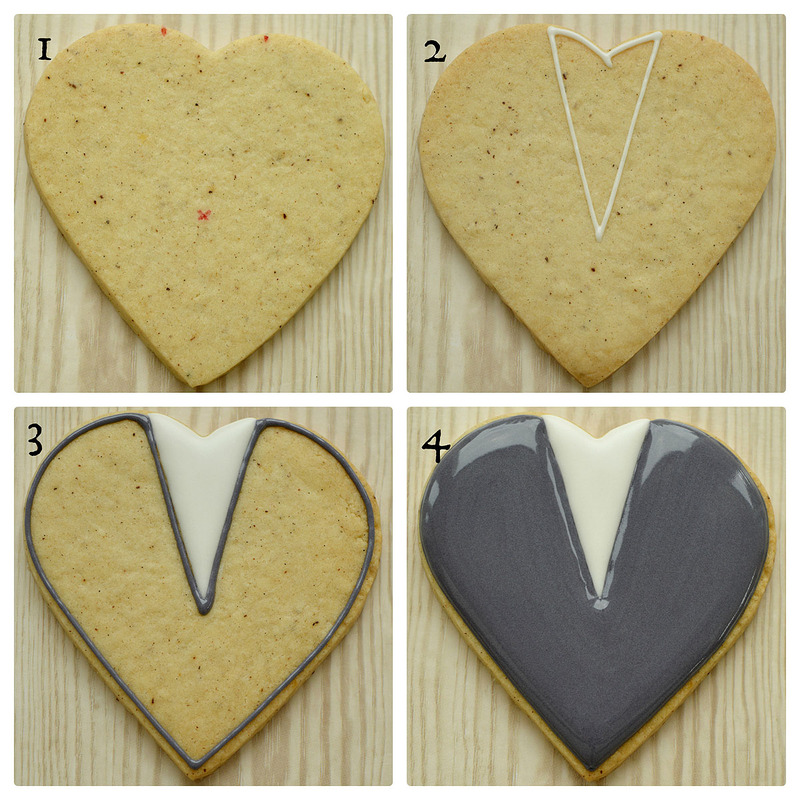 Outline the rest of the cookie and around the triangle in grey flood icing - I found it created a much straighter edge between the grey and white by piping this area first with a straight line. 4. 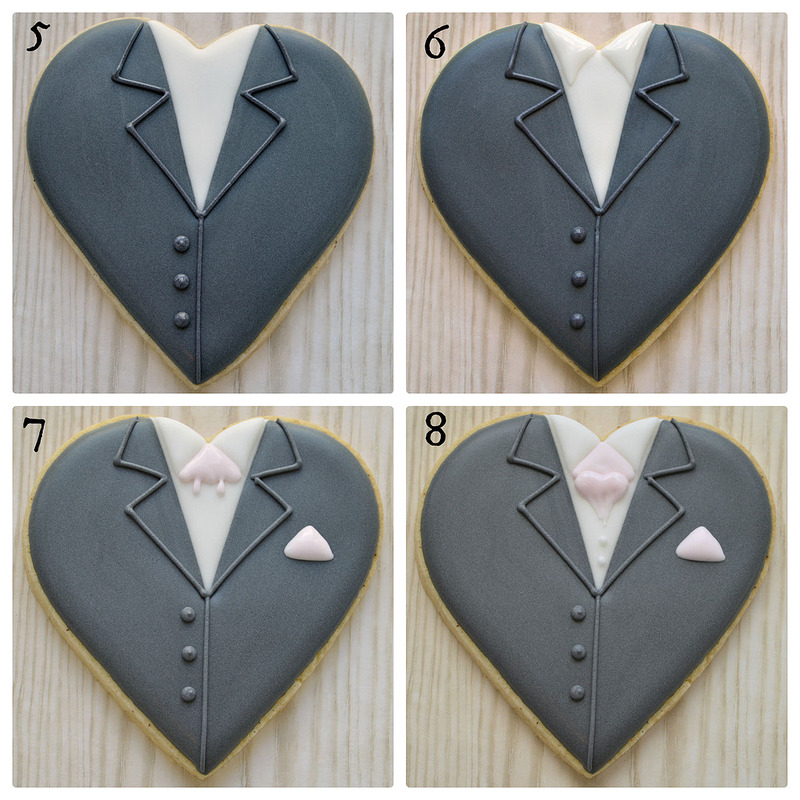 Immediately flood the grey area and set the cookie to dry for an hour or two in a dehydrator or in front of a fan if you have one, to reduce bleeding.Then check your grey in the daylight, notice that it actually looks purple, consider whether the bride will tolerate a purple groom, and scrape it all off. Remix. Repeat points 1 to 4. 5. With the grey piping icing and a tip 1.5, pipe a straight line from the tip of the white triangle to the bottom of the heart. Pipe the lapels above this. Add three dots for buttons flattening them slightly with the tip as you pipe - dots usually look good if they're soft enough not to leave a little peak, but I like the effect in this case. More buttonny. 6. With the white flood icing, pipe two triangles for the shirt collar, using the scribe tool to pull all the corners into sharp points. Immediately get the cookie into the dehydrator as these are very prone to cratering and let them crust over before moving on. Maybe even do them one at a time. 7. Pipe a pink triangle for the handkerchief, and a pink triangle for the top of the cravat. I wanted to create a little lift for the lower part, so I added two tiny extensions underneath - not really necessary if your icing is thick enough, which mine was, but I'd already done them and thought you'd get confused if I didn't mention them. Again let these crust over. You might even want to do them in seperate parts drying them inbetween. I had quite a few cratering issues here - small areas of icing over dry flooded icing seem to be the most prone to this. 8. Add an upside down pink triangle for the remainder of the cravat, mounding the icing up over the small extensions, then using the tip to drag it down into a point, to give the effect of folded and bunched material. Pipe two small white dots for shirt buttons. Finally, mix a little pink lustre dust with alcohol to a thin paint consistency and paint the pink areas to look like silk. You might think I was going to do a tutorial of the wedding dress cookie now. Perfectly reasonable. Except I ate her. Sorry about that. 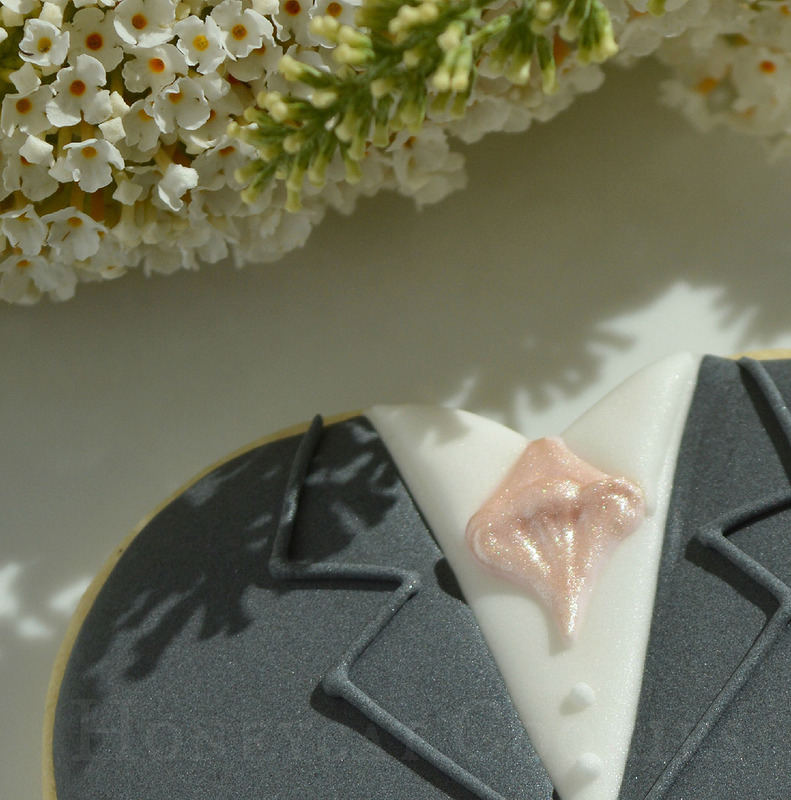 However, if your bride wants a bouquet of flowers she can nibble on during the boring parts of the service, check out my hydrangea cookie tutorial! Beautiful work. Any chance on making a bride tutorial? Thank you! Well - I wasn't lying when I said I ate the bride... 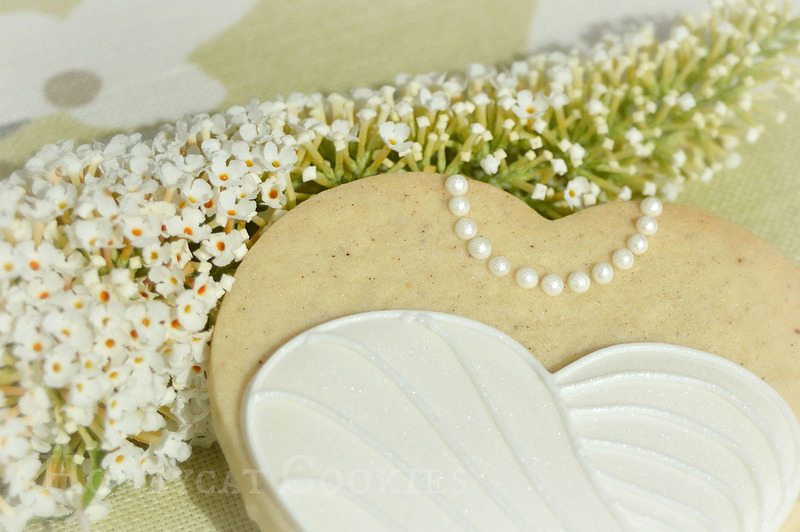 I really did start the process of photographing a bride on a spare cookie, and then I got tired, decided to take a coffee break, and just ate her! One day I will - I shall add it to the list!